The scented organic handmade soap gift set would make a wonderful housewarming gift for a new neighbor or friend. In fact, it would make a lovely gift for yourself too. Some of these homemade soaps look so ‘yummy’. Some are wrapped in fun and cute labels which make gifting and receiving them a real joy. The fragrance from homemade organic soaps usually come from natural aromatic pure essential oils, organic herbs and spices. These organic handcrafted soaps are paraben free with no artificial colorants or phthalates. They are more gentle on your skin compared to harsh chemicals in factory made soaps using synthetic fragrance oils. Besides, pure essential oils come with therapeutic properties. For example, tea tree oil has natural antibacterial properties. 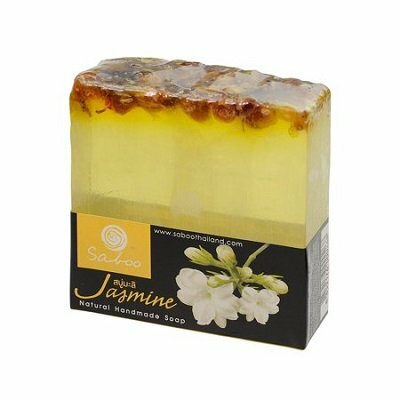 Jasmine soap comes with antiseptic properties besides being used to relax and reduce stress. 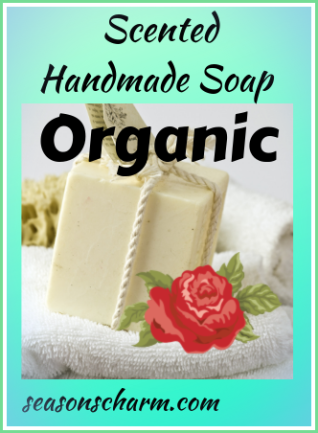 If you have specific requirements for your sensitive skin, then the organic handmade soap made using pure essential oils would appeal to you. Artisanal soap bars are crafted the old fashioned traditional way using cold process soap making. The cold process method retains the benefits of the living oils. Pamper your body as well as your senses with fragrant organic handmade soaps – amazingly smooth with lovely fragrance. Hand cut and handcrafted with pure essential oils, this all natural organic handmade soap is available in 5 different scents. The base of these natural handmade soaps is olive oil, coconut oil, palm oil, rice bean oil, sunflower oil, sesame oil, sweet almond and Thai herbal. They are colored naturally using Thai herbs and spices. Each bar of soap weighs 85 – 100 gm. This mint tea organic soap is made with USDA certified organic shea butter, mint leaf and scented with pure peppermint essential oil. You’ll be happy to know that this invigorating soap is made with no preservatives, artificial colorants or phthalates. Take a look at the impressive list of ingredients – certified organic shea butter; certified organic olive oil; certified organic coconut oil; certified organic castor oil; certified organic palm oil; essential oils; distilled water; sodium hydroxide; natural colorants; certified organic herbs and or spices. Each soap bar weighs about 128 – 142 gm. It comes packed in 100% recyclable brown Kraft box. Besides the mint tea fragrance, you can also get it scented with rose geranium and patchouli essential oils, cinnamon orange essential oils, lemongrass with subtle hints of patchouli and lime essential oils and lots more. A set of these organic soaps with different scents would certainly make a lovely mother’s day gift or housewarming gift. These luxurious fine soaps are carefully crafted in small batches using the cold-process method to retain the benefits of the living oils. Each soap bar is uniquely infused with a variety of organic herbs, Dead Sea clay and salt, seaweed and French green clay. 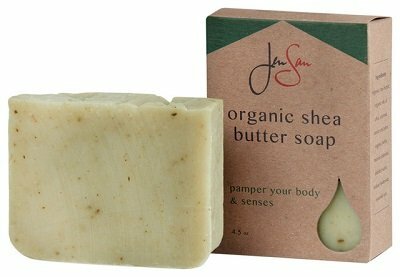 The soap base is made using a rich blend of over 10 USDA certified organic vegetable, fruit and seed oils, plus shea and cocoa butters. These are 100% vegan with no sulfates, no artificial fragrance or color. Each bar size is about 1/4 of the size of a normal full size bar. Each individually wrapped scented soap has its own unique aromatic fragrance with such lovely names as Golden Crown, Sea Breeze, Luscious Lavender and Green Tea Goddess. The Golden Crown scented soap with its luxurious feel is made from Saponified Oils of Pure Olive, Palm Kernel, Avocado, Grapeseed & Oleic Safflower plus Shea Butter and doubly infused with Calendua, oils of orange, fir and frankincense. Dead Sea clay and salt combine with seaweed and scented with an essential oil blend of lavender, oakmoss and fir that brings up pleasant memories of the coast of the Pacific Northwest. What a great way to unwind amidst the scent of lavender. This lavender scented soap bar is made from saponified oils of pure olive, palm, sunflower, avocado, Apricot, coconut, grapeseed, safflower, rice bran and cocoa butter. It is scented with an essential oil blend of three lavenders. Infusions of Comfrey, Chamomile, Calendula and collagen-rich Horsetail as well as green tea are then blended with extra essential fatty acids in a sweet orange herbal blend (clary sage, orange and clove) of essential oils. The lovely scented soap bars are sent in a bag tied with a satin ribbon. Creamy and soft with 4 different pleasant fragrances, this all natural organic scented soap gift set is also suitable for people with dry sensitive skin as these are eco-friendly soaps with no pesticides, preservatives and petroleum by-products. 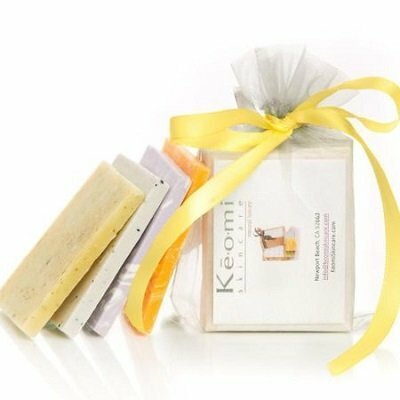 Made in USA with no sulphate, no nuts, no colorants, the 4 individually wrapped scented organic handmade travel size soap bars make an impressive aromatic gift set.